Remember that joyous old-school party chant about the roof being on fire, and how we didn’t need no water, but instead whoever was listening to our collective howls (the fire department, fire gods, etc.) should just “let the MF burn”? That was a really good chant! Sadly, it might also be super-dangerous and you could start a stampede yelling it at a rooftop bar thinking other drinkers will understand what’s happening and join in with you. Instead of risking everyone’s safety because you really wish DJs would play 2 Live Crew songs in public more often, be cool and let the roof be on fire while you drink at Atlanta’s absolute best building-top bars. 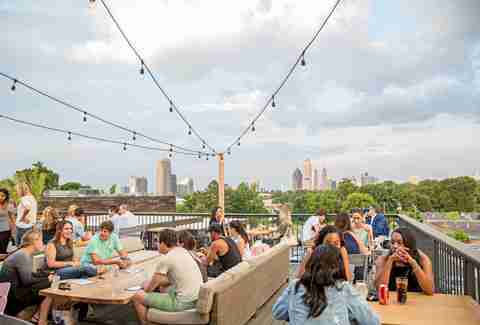 Whether you’re ducking traffic on Howell Mill and Northside, or just enjoying the view of Atlanta’s most memorable dead people at Oakland Cemetery, these are both two of the city’s premiere spots for rooftop boozing. And brunch boozing as well. 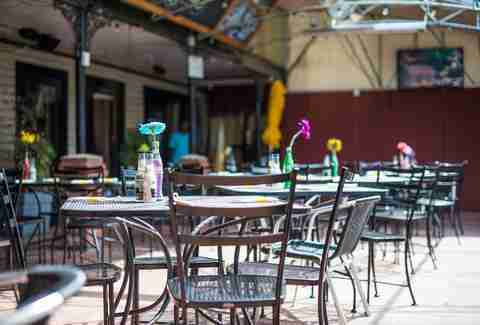 Tin Lizzy’s spot on Memorial’s patio row gives you a ton of reasons not to take it to-go. 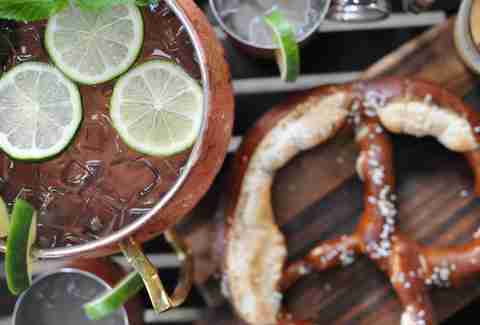 Or at least a dozen of 'em... in the form of margaritas ranging from a watermelon & basil one, to a ginger beer-based Mexi-Mule that's still got one hell of a… kick! Whether you’re in at 7am to catch an obscure soccer match on the other side of the globe, or just lifting a pint in honor of knocking off work early, this Buckhead booze factory is a can't-miss stop thanks to a fantastic view, a deep drink menu, and waitresses who'll charmingly explain that yes, Queens Park Rangers and Rangers are two different things. Get there between 4pm and 7pm for $6 bar snacks like Harp-battered fish tacos, a $5 beer of the month, and $7 premium wines and cocktails. The second entry into the swanky stretch of patio that is Grant Park, Republic stands out for its daily specials ($2 dollar taco Tuesdays, cheap wings on Mondays) and special weekly events (Rare Form DJs on Friday and Saturday nights, Dirty Bingo on Wednesdays and Dirty South Trivia on Thursdays). Oh, and don’t forget the $15 bottle of bubbly with OJ on weekends. 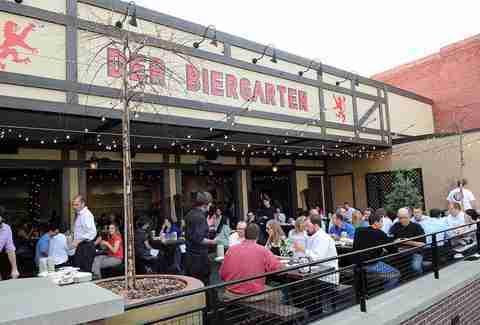 Drinking beer out of a stein on a beer garden roof in Downtown ATL has crazy cultural benefits, starting with the buzz that results from all that German beer you’re getting in one vessel. Will you fail at pronouncing the names of many of these Reinheitsgebot-approved brews? Absolutely. Will that be OK? Absolutely. Having existed under several other names over the past several years (most recently as Rooftop 866), Smith hasn’t needed to change very much. The sprawling area that seems to exist in the middle of every Midtown skyscraper is much like Drake in 2016 -- it has a chill vibe and offers better than average Views even if you just want to sit down, let your feet hang, and sing melancholy songs about girls who work at Hooters on Peachtree. You might even get More Life! I’m so sorry (bad joke, and not Drake’s finest work). This throwback comfort food hangout was created in what used to be Cameli's rooftop, and is now pretty much dedicated to your life in the '70s... if you were actually alive and if you could have been able to drink vintage cocktails. Those cocktails include strong stuff like Singapore slings, absinthe sazeracs, and Harvey Wallbangers. They also have vinyl records playing on a community turntable and movie nights every Thursday where they screen classics like The Rocky Horror Picture Show, Alien, and Jaws. The panoramic views of Downtown you can see from high above the W Atlanta Downtown hotel’s lobby is enough to draw crowds, but it’s the addition of amazing DJs, from locals like Ree de la Vega to Samantha Ronson, and the fact that WETBAR is ATL's only all-weather rooftop bar with a zero-edge pool -- which seems like it should be spilling out onto Ivan Allen Blvd -- gives it the ultimate cool status, particularly if you're around during summer months. The Midtown skyline is the POV yo'll have here above the Westside Ironworks building that houses ATL's newest sushi import from Japa... er, Charleston. The beer, wine, and cocktails like the “Pamplemoussetache” w/ Japanese whisky are great ideas, but in case you’re interested in a glass or bottle of craft sake while peering out at the towers along West Peachtree, you now have that option. The inside almost completely burned up a few years ago, and that sucked. 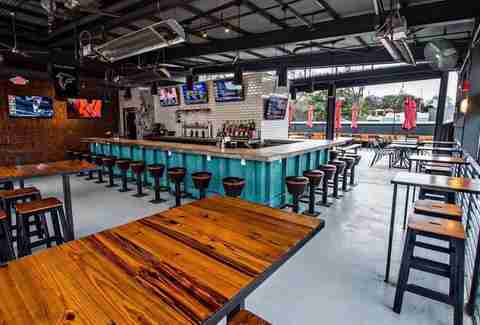 But then it came back with a rooftop patio situated right in the heart of Little 5 Points. You’re in the center of Atlanta's strangest neighborhood, with a bird's-eye view of purple and pink mohawks attached to bodies wearing matching sneakers. Not a bad place to drink local beer! 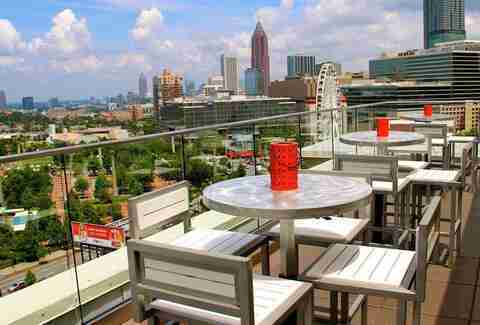 As long as The Glenn Hotel’s centrally located roof exists, it should remain in the top tier of ATL’s most scenic building-top bars. It’s hard to get a better view of Downtown and beyond than what’s in your frame of vision on the 11th floor. The drink menu includes three wines by the glass (a pinot grigio, Chardonnay, and pinot noir), cocktails like the margarita-esque Smoked Roca, with pineapple and a paprika salt rim, and the Cathead Honeysuckle Vodka Rye Derby. 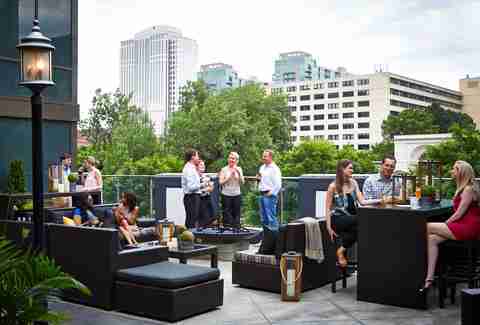 It’s also a great place to catch musical performances during their recurring SkyLounge Live weekend shows. You never have to worry about getting a watery brew from a kicked keg at 5SW, since they're brewing the suds right there on site and bringing 'em up to you while you look down with empathy (or evil joy) at everybody stuck in traffic below on Howell Mill. Don't let that stop you from ordering one of their dozens of single-malt whiskeys, ryes, bourbons, and hyper-local cocktails like the “Battle of Atlanta,” which mixes sweet tea vodka, Peachtree schnapps, house-made lemonade, and Coca-Cola. Sitting above American Cut in Buckhead Atlanta, TRCC is a seasonally open classic cocktail bar for elegant enthusiasts of booze, with chairs shaped like cocktail strainers lining an upper deck overlooking the north side of Peachtree Road. There’s live music or a DJ most of the week, including monthly Havana Nights every first Thursday, where you’ll dance to a live salsa band and hit a muddle-your-own mojito station. 9 Mile Station, located in a corner slightly separated from the rest of PCM’s rooftop carnival Skyline Park, is more than a beer garden -- it’s a beer garden with low-ABV draft beers, high-gravity stouts (appropriate for your location), three types of Old Fashioneds, a house shot that mixes Campari with Fernet-Branca called the Ferrari, and a peach bourbon drink they call DePeach Mode. You can also buy wine by the glass or bottle and sip enough to completely crush Skyline Park’s games as you get back to your Skee-Ball-loving childhood. Every Sunday at 4pm this food intersection of Spanish, Moroccan, and Indian flavors welcomes you to have half-priced bottles of wine outside and up top, beneath its huge marquee sign. 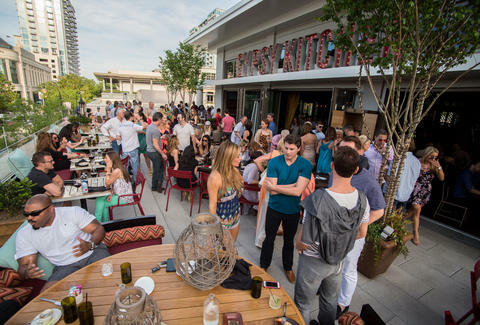 You can also get $6 glasses of rosé, $5 tintos de verano, and paella served right on the patio while you jam to a flamenco guitarist’s strummings until 7pm, when a DJ takes over. While you won’t see any Braves games happening just down the street anymore, this Ralph David Abernathy barbecue bar still offers supreme looks at Turner Field, which should be fun -- or very sad -- to watch being demolished soon, but will end up being something eventually so don’t cry for too long. 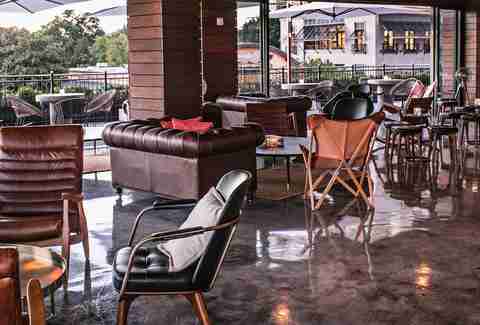 The modernist, woodsy design somehow blends in with the historic vibe of the area, so you’ll feel like The Perfect Atlantan when you drink the actual cocktail, made of Crown Royal Apple, agave, Chambord, lime and cranberry juice, or the Hennessy peach tea. Hell, if it’s hot (and it will probably be), get the house special TDH made with Hendrick's gin, cucumbers, lime, and ginger beer. 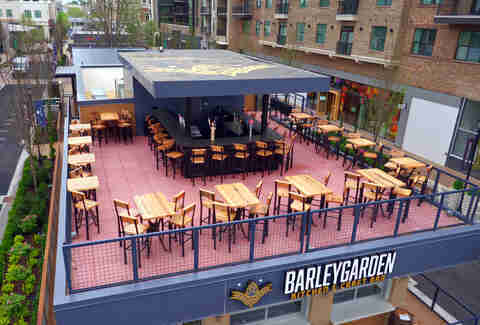 From the Hop City empire comes Barleygarden, which has brought a beer garden to the Avalon retail, restaurants and residential development, and therefore serious beer credibility. 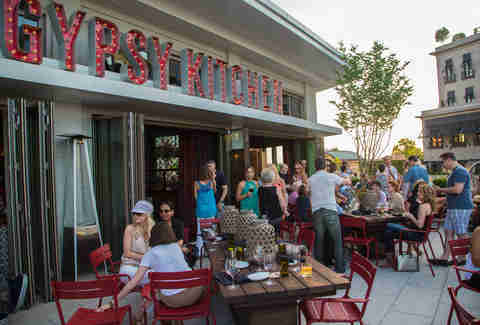 There’s a covered patio bar outlined by stools with butcher block seats, from where you can sip top shelf Euro brews, canned local beers, and cocktails like the Oxford Cloth Psycho -- their version of a Sazerac. If you somehow get bored with the view, well, you shouldn’t be reading this list, but at least you have the legal option of walking around Avalon with an open container. Hopefully you like meat if you get hungry; Kevin Ouzts of The Spotted Trotter is executive chef, so there’ll be charcuterie, sausage, and all that kind of stuff, paired to go perfectly with your bevvie. 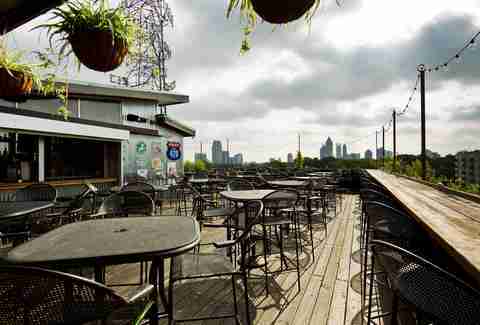 Mike Jordan sometimes sits on the roof of his house with a local craft beer when traffic is too crazy to get to these great Atlanta rooftop bars. If there’s a rooftop bar he missed that you really think people need to know about, tweet him at @michaelbjordan and he’ll retweet you.